All these Chinese characters in the text are driving me crazy… I think they mean one thing, and later I realize it means something else. There were 2-3 words that I had to change because of that. Thankfully, it was a minor word (kind of) but it still kind of pissed me off. I need to work harder. Chapter 6. The Daughter’s Scarier?! Peng Ga Ho was scared out of his mind, when someone suddenly talked to him from behind while he packed provisions. When he looked back, he saw Nangong Yubin, who had a big grin on his face. Peng Ga Ho cursed in his mind. If someone figured out someone else’s thoughts, that person was bound to get annoyed. Peng Ga Ho obviously felt annoyed, and mumbled a bit under his breath. Then he asked a question. Nangong Yubin nodded with a smile at Peng Ga Ho’s arrogant words. Peng Ga Ho, who wasn’t expecting Nangong Yubin to admit it immediately, put on an evil smile on his face, while stroking his chin. Even though they were both from the five great families, they weren’t really well-acquainted with each other. But based on today’s events, a sticky bond would form that would tightly link the two together. The two formed a plan to escape the school, and went back to their own dorms. After separating with Nangong Yubin, Peng Ga Ho, at his own dorm room, became a little worried about something. If he just disappeared all of the sudden, that guy would definitely get worried. Peng Ga Ho thought of Cho Ryu Hyang a bit, then immediately wiped the boy off his mind by shaking his head. If he told his friend that he was going to the Qilian Mountains to fight the Demon Church, his friend was bound to get worried. He didn’t want to get his friend get worried like that. When he thought of boasting about his adventures at the Qilian mountain to Cho Ryu Hyang, he got excited already. How long could a person stay awake without sleeping? If a person didn’t have a body trained with martial arts, he or she would only be able to last about 4 days. Then how long could a little boy, who didn’t even learn martial arts, be able to stay awake without sleeping? It’s a little hard to know, but it can be assumed that he or she probably wouldn’t even be able to manage two days. Grandpa Jang, who took care of Cho Ryu Hyang, couldn’t sleep very well the last two days because he was so anxious. The young master brought some piece of paper back home, and started working on some sort of math equation without even eating. Because there was an event similar to this in the past, the man thought this would pass after a while. The young master, who would solve even the hardest of problems in one day, was holed up in his room for over four days. He was mumbling to himself while writing down something on the paper. When the old man lifted the paper a little bit, he discovered that it was filled with complicated numbers and symbols, layered on top of each other. Even looking at it was this hard, but the young master already made several of these papers already. The papers were all sprawled on the floor. Looking at the young master, who said those words with absentmindedly, the old man sighed. Grandpa Jang shook his head. He sat himself down on the ground on his knees, and spoke sternly. 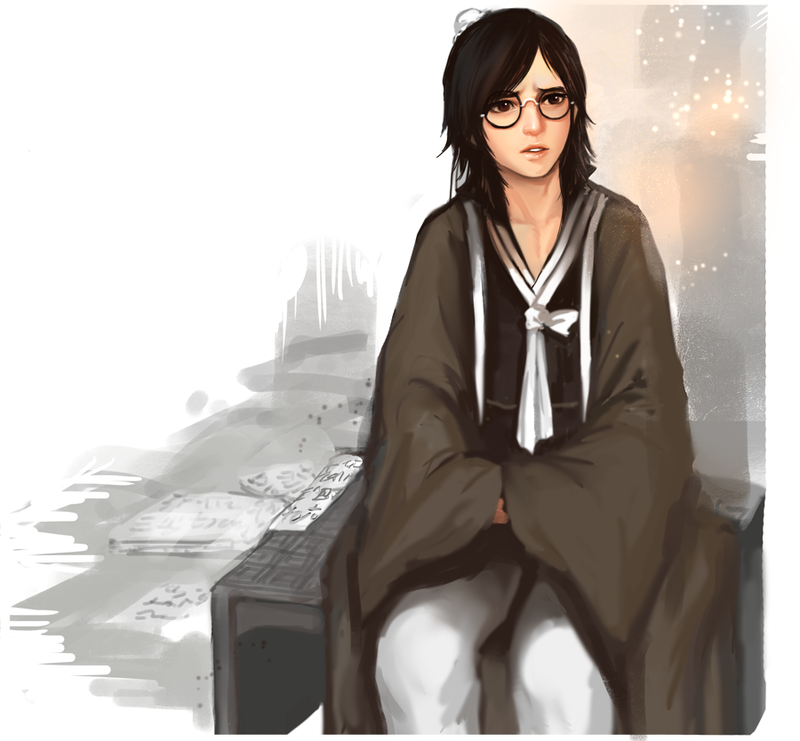 Cho Ryu Hyang sighed, and fixed his glasses when he heard grandpa’s resolute words. He was so close to getting it, and he didn’t have time to waste on things like this. It felt like he could get the answer if he just played around with the numbers more, and if he got interrupted like this, it would be troublesome. Cho Ryu Hyang opened his mouth without taking his eyes off the paper. Grandpa Jang, looking at the boy, who was speaking with absentmindedness, once again sighed. Even though the young master was smart, he usually forgot about anything that was usually deemed useless to him. Cho Ryu Hyang flinched, and took his eyes off the paper, while scratching his head. Speaking of, it felt like he hadn’t slept for a few days. Once he realized this fact, his head spun. He suddenly became very dizzy. After managing to come back to his senses, he took a look at himself with the copper mirror. What he saw truly surprised him. His tired eyes became red from stress, and his hair was all bunched up from the excess oil. After looking at himself for a while with an open mouth, he smirked a little, and took off his glasses. When grandpa heard Cho Ryu Hyang speak in a sorry tone, he quickly wiped his sore eyes with the back of his hand, and spoke. Cho Ryu Hyang couldn’t refuse grandpa, who forcefully sat the boy on the table with the food. Cho Ryu Hyang felt very sorry for the old man, as the old manservant looked as haggard as he did. Cho Ryu Hyang’s chest tightened when he looked at the steaming food laid out in front of him. He was so close to getting it, he felt as he could actually touch it. But the thing refused to show itself. The unwound formation the teacher drew for him. This formation, whose name Cho Ryu Hyang didn’t even know the name of, was actually an incredible object. It seemed simple because teacher drew it in mere minutes, but that was a huge misconception. There were arrays upon arrays of numbers that intertwined with each other in the paper. It felt like these arrays had neither a start or an end. It was hard to even decipher the numbers that were put on the outside, but when one managed to look inside the formations, there were things that would shock someone to no end. There were countless changes regarding the numbers happening all at once within, constantly. But it’s not like there were no gains during the past four days. The movement of the formation. Cho Ryu Hyang managed to find the order of the arrays, and also figured out the changes within the formation. Cho Ryu Hyang found out about the existence of variables. Cho Ryu Hyang put his thumb on his aching temple, and smiled. It was hard enough solving equations that had one variable. But there were 8 of them. If there were this many of them, of course the calculations wouldn’t move along smoothly. So he changed his way of approaching the problem. It wasn’t something that he really wanted to do. A truly simple, stupid plan. He was just popping in random numbers into the variables, and found the answers that way. Because of that, the time he took to decrypt the formation took too long. But the thing is, even if he took all that time to go through all that, he still couldn’t find the answer. The equation just refused to be solved. Whatever number he threw at it, it rejected all of them. He thought he should try to approach the problem again later with a clearer mind. Cho Ryu Hyang put his hands towards the table. Hunger started to come at him like a wave, probably because he regained his senses a while back. The people who are currently ruling the martial world. The world refers to these 15 people as the 3 Sovereigns, 5 Emperors, and the 7 Kings. The 15 guests reached the harmonious stage in martial arts using their own ways, which was known to be the human limit. Each of them possessed a power equivalent to a relatively big clan, and every action they made influenced the world greatly. There were individuals within the 15 guests that were said to be on a different class compared to other humans. Each of them represented Righteousness (正), Evil (邪), and Demonic (魔). Many people tried to rank the three, but a conclusion had yet to be reached, even after 20 years. After all, the 3 of them were at the very pinnacle. They couldn’t really be ranked. That was why many martial artists desired to see the 3 fight each other at least once in their lifetime. First, the Sovereign many deemed to be the strongest. The sun that shines brightly upon the Righteous, the strongest swordsman the world has given birth to so far. The Dao Emperor (太極劍皇), Baek Mu Ryang (伯武兩). Appearing in the Martial world at the age 30, he was the first to show the power of the ones that harmonized their inner power. He did not find any who could fight him for 40 years, and right now, he was presiding over the group known to fight for the righteousness in the world, the Righteous Path Alliance (正道盟). The man’s nickname was even the “Unrivaled Swordsman”. It wasn’t an exaggeration to call him the strongest under the heavens. Also, Baek Mu Ryang was the only Sovereign that actually boasted his powers out of the three. Secondly, the most mysterious, and strange Sovereign. Known to be the strongest in the evil side. The Dark Moon Guild’s (黑月會) former manager, also known as the grim reaper from hell. Black Moon King (黑月夜皇), Neng Mu Gi (冷武器). The guild he was in, the Dark Moon Guild, used to be one of the minor guilds in the evil side. But that was all before the extraordinary reaper known as Neng Mu Gi came into the scene. After Neng Mu Gi joined the Dark Moon Guild, the guild changed. The guild started to work as mercenaries. All of the sudden, the Dark Moon Guild became one of the biggest guilds in the side, and their name represented “Evil”. 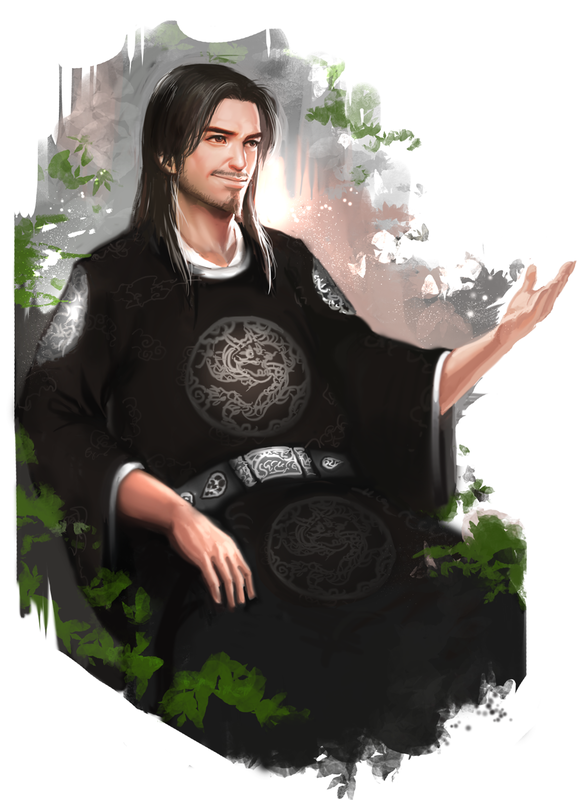 The one that the martial world fears the most, the emperor of the night. There was no one who was left alive after they were visited personally by the Black Moon King. Apparently, the Black Moon King only carried out about 20 missions. Compared to the weight of his name, the number of times he killed was exceedingly small. But if one looked at the people he killed, they would be shocked out of their mind. Each one of the people that he killed, was either leaders of an extremely large clan, or were superhumans that existed before the 15 guests arrived, the 10 Absolutes (絶代十客). Out of the 10, 6 were killed by this one man. When one’s inner power reaches the harmonious state, their senses get improved tremendously. Because of this, they cannot be killed by mere assassins. This means in order to kill them, a person had to fight them head-on. In this situation, an assassin would be extremely disadvantageous. But even with this disadvantage, the Night Emperor (夜黃) Neng Mu Gi managed to kill 6 experts who reached the harmonious state. That meant the Night Emperor was at least twice as strong as the experts. The martial world became extremely surprised by these events. It was deemed impossible to assassinate experts, after all. But the Night Emperor managed to do it. Out of the 10 Absolutes, only 4 remained. It was a little strange phenomenon, but when the 6 experts got killed, many more experts managed to reach the harmonious state. What happened was, the sons and daughters of the leaders that got killed by Neng Mu Gi trained themselves to the utter limit, so that they could beat Neng Mu Gi. They managed to form what is known as the 15 guests today. But even after attaining that title, they were unable to do a thing to Neng Mu Gi. Why? When experts grow in power, they begin to be able to roughly estimate the power of their opponents. That’s how they knew it. The Neng Mu Gi they considered beatable in the past, was actually something that was just impossible to reach. Because of that, quite a lot of martial artists claimed that Neng Mu Gi might be the strongest out of the 3 Sovereigns. Even though the Sword Emperor (劍), Baek Mu Ryang also managed to kill an expert at the harmonious stage, but compared to the 6 that the Night Emperor managed to destroy, it wasn’t really worth looking at. And the last of the Sovereigns, the descendent of the Heavenly Demon. Demon Emperor (暗黑魔皇), Gongson Chun Gi (公孫天器). When his name was discussed, even the loudest of the experts went quiet. The very definition of fear in the martial world, the Heavenly Demon Church. From the past, it was said that whenever the Heavenly Demon Church made their move, the places they swept through became a sea of blood. Gongson Chun Gi was the leader of that immense power, and was known to be the strongest in the history of the church. But his position in the martial world was a bit strange. As one of the sovereigns, the Demon Emperor, Gongson Chun Gi never displayed his powers in the martial world. Everyone was curious about how strong he really was. No one doubted the man’s powers. The force he lead was too big and powerful to even arouse a spark of doubt in their hearts. The girl with a wise glint in her eyes. She wrinkled her eyebrows as she looked at her father. He had a troubled look on his face as he spoke to his daughter. The daughter’s face turned uglier the longer her father’s speech continued. Eventually, she threw down her brush on the ground, and exploded. Since martial power couldn’t be measured by numbers, one could only measure it by comparing it to something else. To do that, one must establish a clear reference to start on, but since even the reference point was messed up, everything else was bound to be inaccurate. At the girl’s sudden question, Neng Pa Chun answered hesitantly. The girl responded sternly at her father. Neng Pa Chun flinched when the girl said that. The girl screamed loudly, and kept scolding her father. A little later, she started smacking her chest out of frustration. Neng Pa Chun finally put on a sad face, and nodded. The girl shut her mouth. The man was her father, and yet he’s way of work was too pathetic. The girl started thinking about something carefully. She no longer felt that her father could be trusted with his job. Multitude appreciation for the chapter. Things are picking up. Interesting story and interesting MC (I mean, it’s math. This is my first time reading martial arts story with math as its center and it was mysteriously addicting). The dad is actually Saitama’s great great great great…….. grandson. Believe in the Saitama that believes in Neng Pa Chun!